Ahhh...Pots: A Review and Giveaway! How Do You Preserve Your Wood Items? Need New Gardening Gloves? Win Some! Our Little Acre is...well...an acre, but the configuration of that acre is such that our property is somewhat narrow and deep. 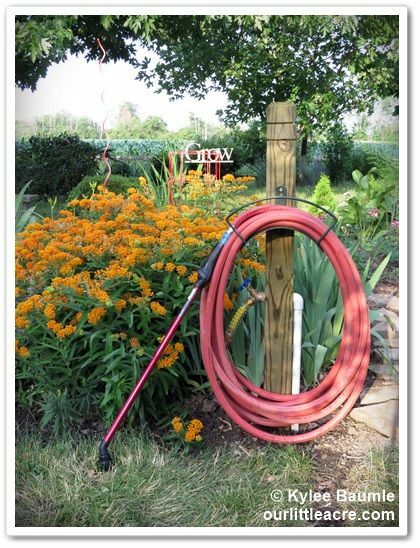 The lion's share of our gardens are located at the back of the yard and the spigots for hoses are at the house and at the pool house. 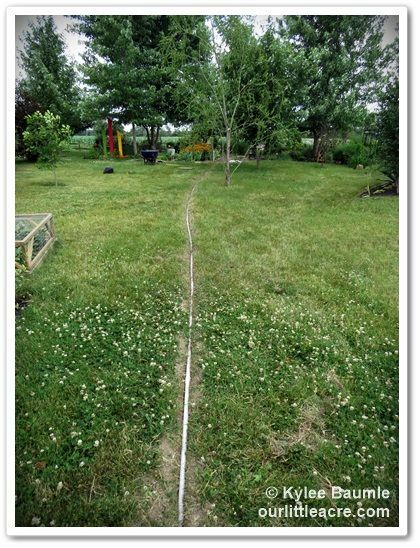 That means we have to drag hoses to and from the back gardens and that is, plain and simple, a pain in the behind. The theme for this month's Lowe's Creative Ideas project is irrigation, so we took this opportunity to remedy our watering issues. After the last three summers of being hot and dry, we took on this project with great enthusiasm. Last summer's drought just about did us (and the gardens) in. Without getting into sophisticated irrigation systems, which would be complicated in the case of our crazily-configured gardens, our solution was to run PVC pipe from the spigot on the pool house to newly-installed spigots at the chicken coop and all the way out to the garden at the back, where there would be two more spigots - one on the west side and one on the east side. 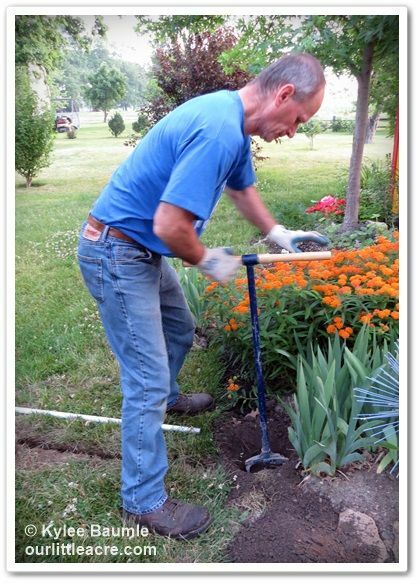 That way we didn't have to drag a hose across the garden itself. 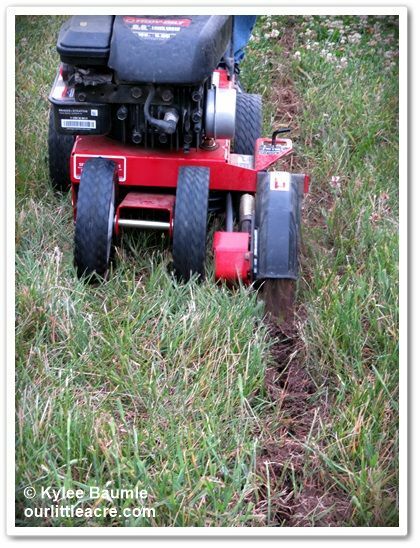 Romie used our Troy-Bilt edger to cut a shallow trench for the PVC pipe and I followed and deepened it with the Cobrahead tool, which shows yet another great use for it besides weeding. Since we have to blow out the water lines for the pool every fall in preparation for winter, that's what we'll have to do with these too, so they don't freeze and crack. 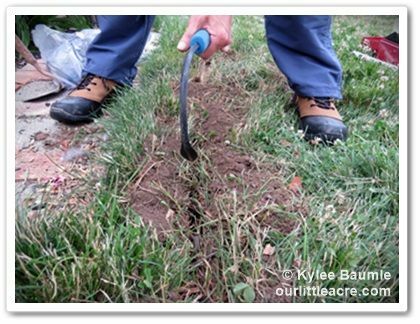 They're about 4-5 inches deep - not the 30-36" depth needed to be below the frost line. 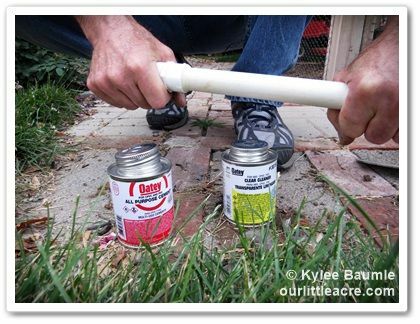 With an assortment of Ts and elbows and straight ¾-inch PVC pipe, Romie ran it where he needed it, using cleaner and adhesive to connect them all together. 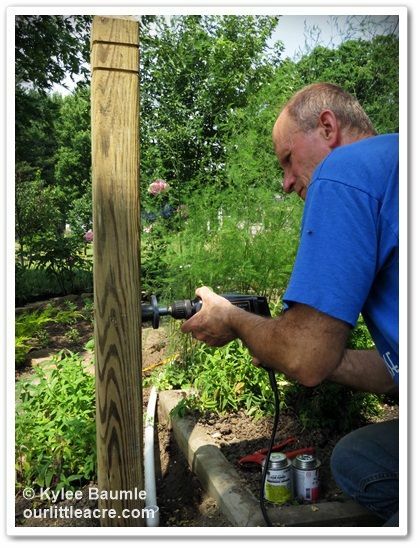 e used treated 4x4 posts for mounting the spigots, and drilled holes through the posts for the pipe so it didn't stick out from the posts so much. That also stabilized the spigots. We attached heavy duty hose holders to store our Dramm hoses at the spigots. The project was easily completed over two-and-a-half days and probably could have been done in even less time, but with temperatures in the mid-90s and high humidity, we had to take a lot of breaks. I started watering with our new system immediately and all went well, with no leaks! 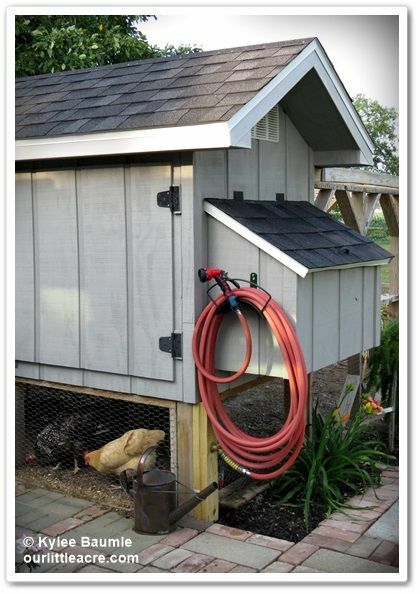 I'm so glad to not have to drag the hoses all the way back there to water the gardens and it's nice to have a spigot right there at the back of the greenhouse by the chicken coop, too. 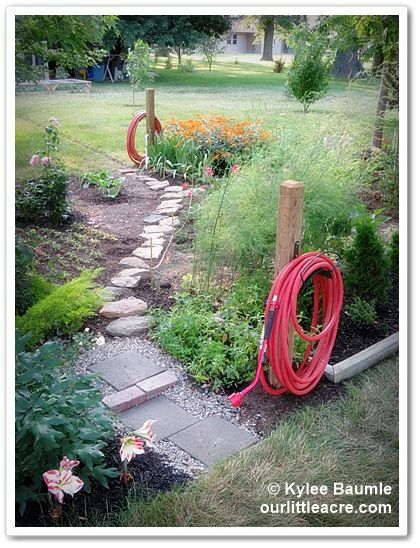 Check out other Lowe's Creative Ideas for your home and garden here. 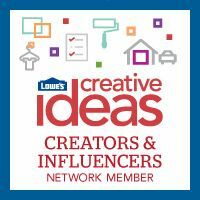 And for more blogger's projects and ideas, visit the Lowe's Creative Ideas Blogger Network page. As a Lowe's Creative Ideas team member, I am provided with Lowe's gift cards to cover the cost of myprojects. 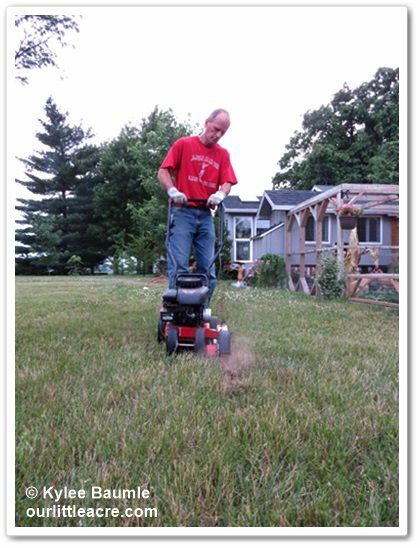 The Troy-Bilt edger was provided to me last year free of charge as part of my participation as a Saturday 6 team member. Dramm provided the hoses and watering nozzles and wands. I am always impressed by the ways people find to handle the watering chores. My problem is the spigot is on the house and all the gardens, ornamental, Rose Walk and Vegetable are on the other side of our driveway/road. We end up leaving the hose running around the Lawn Beds most of the time. Unsatisfactory. Fortunately there hasn't been much need for watering so far this year. Daily tropical late afternoon/nighttime rains. Great stuff just what I have been looking for. One question. 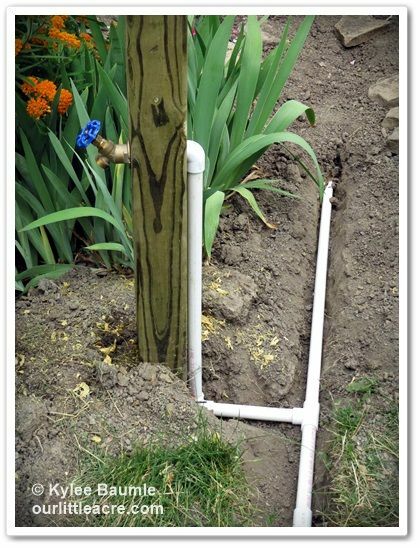 How did you connect the pvc to the water source?